The Emmy Award-winning animated series continues with Star Wars: Clone Wars Volume Two, available for the first time on DVD. Directed by Genndy Tartakovsky, this series captures George Lucas' vision in a dynamic animated style that is a visual delight for all ages. 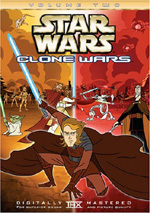 As seen on Cartoon Network, Star Wars: Clone Wars Volume Two concludes the epic adventures that bridge the story between Star Wars: Episode II Attack of the Clones and Star Wars: Episode III Revenge of the Sith. Witness firsthand the trials of Anakin Skywalker and the secret ceremony in which he becomes a Jedi Knight. Then, follow the Jedi as they attempt to repel a surprise attack by General Grievous, on the galactic capital, Coruscant. Clone Wars Volume Two is filled with exciting galactic battles that lead directly to the beginning of Revenge of the Sith. 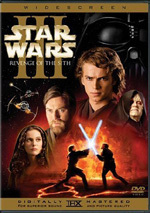 Viewers who went into Star Wars: Revenge of the Sith without much foreknowledge may have found themselves lost. Heck, I do know a lot about the Star Wars universe but still felt somewhat befuddled during the first act. If I’d had a primer via the animated Clone Wars series, I might’ve been better prepared. We got the first batch of these tales on the first volume of Clone Wars, so it should come as no surprise that Volume 2 brings things up to date. Or up to the start of Sith, that is. Fun and action dominated Volume 1, but it presented little plot or real story telling. That happened because it consisted of 20 very short segments that averaged about three and a half minutes in length. Each of these essentially stood on its own, so the filmmakers lacked much time in which to tell a narrative. Battles were the order of the day, not plot. That changes with Volume 2. It still runs more than an hour long, but it features only five episodes instead of 20. You can do the math to figure out that this allows much more time for depth and characterization. And that’s what dominates Volume 2. We see why the Jedi decide to promote Anakin Skywalker (voiced by Mat Lucas) to their ranks earlier than usual, and we also follow his trials. This leads him to a major test on the planet Nelvaan. In addition, the Jedi deal with the threat of droid separatist leader General Grievous (Richard McGonagle). Because of this we see a full droid invasion on Coruscant and the defense led by the Jedi. We also follow Grievous’s attempts to kidnap Chancellor Palpatine (Nick Jameson). Some of this material will sound familiar to viewers of Sith, since that movie’s early moments focus on Grievous and his seizure of Palpatine. Clone Wars gives us all the details that lead up to those issues and does so with style and flair. As I noted, this package offers less action and more emphasis on character. That means Volume 2 lacks the same giddy energy as Volume 1, but it also avoids the feeling of redundancy that occasionally mars the first 20 episodes. As fun as they are, the rapid-fire pacing makes them wear on you a little. Volume 2 is much more of a cohesive narrative and not just a collection of fights. I like the spotlight on Anakin’s path to become a Jedi. Volume 2 gets into that well and gives us a little more insight into his personality and choices. The glimpse of Grievous and the kidnapping is also valuable. I’m sure I’m not the only one who saw Grievous in Sith and had a “who’s he?” reaction. A major character unceremoniously dropped on our laps, it was tough to get into him initially. Clone Wars opens up our understanding of him and gives us a lot more depth into the situations. Rich and intriguing, Clone Wars Volume 2 offers a fine connection to Sith. It fills out gaps in the story well and stands on its own without much trouble. I have no doubt that Star Wars fans will really enjoy it. 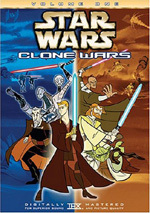 Star Wars: Clone Wars appears in an aspect ratio of approximately 1.78:1 on this single-sided, single-layered DVD; the image has been enhanced for 16X9 televisions. Volume 1 looked terrific, and Volume 2 seemed even better. Overall, the episodes consistently demonstrated solid sharpness. All the shots seemed nicely detailed and well defined, as I witnessed no signs of softness. Virtually no examples of jagged edges and moiré effects appeared, and I noticed no issues connected to edge enhancement. No source defects showed up, as the programs consistently looked clean and fresh. The programs demonstrated a palette that was quite varied and dynamic. The hues came across smoothly, and they always looked rich and full. At times the colors became quite gorgeous, and the DVDs always replicated them well. Blacks seemed tight and deep, and the few low-light shots were appropriately dense but not overly thick. Although the animation itself was somewhat blocky, the quality of the visuals was consistently excellent. Although Volume 1 came with only a Dolby Surround 2.0 mix, Volume 2 of Clone Wars boasted a full Dolby Digital 5.1 soundtrack. Don’t get too excited, though, since both were really quite similar. The main advantage of the 5.1 upgrade came from a few examples of stereo surround material. Occasionally I heard some unique elements in the rear right or left speakers. In general, surround usage was stronger than during Volume 1, as we got a fair amount of material from the back channels. Otherwise this track reminded me a lot of the 2.0 mix for Volume 1. The front speakers offered the majority of the information. They showed good stereo imaging and meshed together quite well. A lot of useful effects popped up, and these made the front spectrum pretty worthwhile. Ships zoomed across the speakers and battle elements like gunfire and lightsabers zipped from side to side. I found the audio quality to seem positive. Dialogue demonstrated nicely concise and crisp tones, and I heard no problems connected to intelligibility or edginess. The score came across as full and dynamic, as all the music was bright and rich. Effects seemed fairly accurate and natural. The track exhibited good bass response as a whole, as the mix seemed pretty deep and warm. Overall this was another lively and effective mix. A smattering of extras pop up on Clone Wars. First we find an audio commentary with director Genndy Tartakovsky, writer/storyboard artist Bryan Andrews, art director Paul Rudish and production coordinator/writer Darrick Bachman. All four sit together and present running, screen-specific remarks. This format offers a definite improvement over the prior solo track from Tartakovsky, as it makes for a livelier chat. The guys discuss connections to Sith, development of the story and deleted sections, references and influences, working with Lucas and staying consistent within the Star Wars universe, scheduling pressures and various technical/animation issues. We get a very nice overview of the subjects. Matters stay light and genial, but lots of good information appears here. The track delves into the topics with reasonable depth and proves to be a successful commentary. Connecting the Dots lasts 10 minutes and 24 seconds. The featurette includes movie shots, behind the scenes elements, and comments from Tartakovsky, Bachman, Andrews, and Rudish. They cover some of the same topics discussed in the commentary as they go over the genesis of these episodes and connections to the movies. Though occasionally redundant, it offers a good recap of the issues. Inside the “Video Games” area, we get a few components. This domain includes trailers for both the Battlefront II game and Empire At War. For those appropriately equipped, we also get a Battlefront II XBox Demo. Two Still Galleries also pop up here. We find “Sketches and Storyboards” (43 frames) and “Posters and Artwork” (50). Both offer quality collections of material. Another ad appears via the Episode III Trailer. This is the full trailer, not the teaser that appeared on the Volume 1 DVD. Revenge of the Brick runs five minutes and 17 seconds. A computer animated spoof done with Lego elements, it provides a comedic take on parts of Sith. Cute and fun, it makes for a nice addition to the DVD. The DVD features the THX Optimizer. Also found on many other DVDs, this purports to help you set up your system for the best reproduction of both picture and sound, ala stand-alone programs such as Video Essentials. I’ve never tried the Optimizer since I’m happy with my settings, but if you don’t own something such as Essentials, the Optimizer may help you improve picture and audio quality. I enjoyed Volume 1 of Star Wars: Clone Wars and thought that Volume 2 was similarly positive. The shows broadened my understanding of the Star Wars universe and proved to be very well made. The DVD presented excellent visuals with solid audio and a decent set of extras. I look forward to a quintuple feature of the three Star Wars features along with both volumes of Clone Wars someday, and I think all fans will want to have a copy of this terrific title.